Have you heard of zoodles yet? They’re a delicious replacement for pasta, and they’re made out of zucchini! You can make them with a vegetable spiralizer, a mandoline, or a julienne peeler. Any way you slice them, they’re perfect for light summer dinners. This skillet dish serves four and comes together quickly — you don’t even have to defrost the shrimp before cooking! With a splash of Garlic Gold® Oil, they’re done in about ten minutes. Next, you’ll sauté your zoodles in the same skillet, then toss everything together with a big dollop of pesto. Just like that, a healthy, delicious dinner is served. 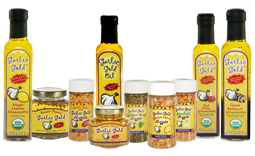 Another winning recipe from Organic Garlic Gold®. In a large (12-inch) skillet, heat the Garlic Gold® Oil over medium heat. Add the shrimp to the skillet in a single layer, then cover and let cook for about five minutes, until the shrimp begin to turn pink. Stir and flip the shrimp, then cover the skillet for about three more minutes, until the shrimp are just cooked through. Use a slotted spoon to transfer the shrimp to a bowl and set aside. There will still be oil and liquid from the shrimp in the skillet. Add the zucchini to the skillet and sauté just until slightly softened, about three minutes. Add the shrimp back to the skillet with the zucchini, along with the pesto. 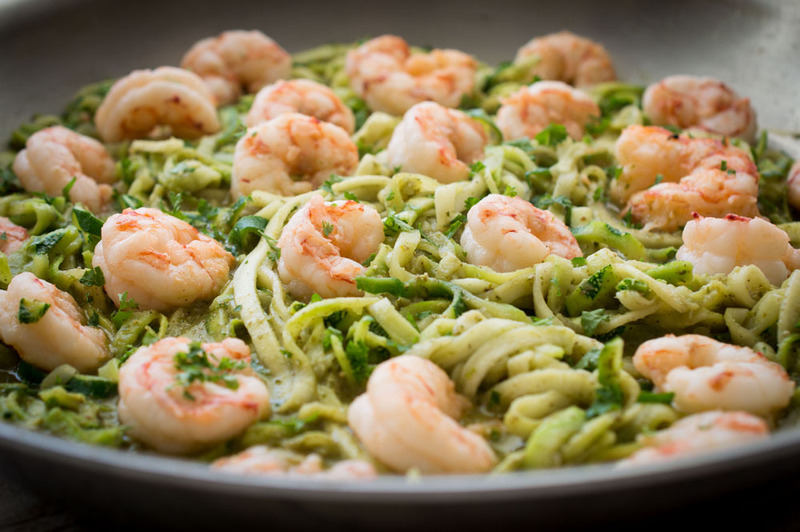 Stir until the zucchini and shrimp are coated evenly with the pesto. Serve hot.